My name is Rose and I am a Canadian freelance writer with a healthcare background in nursing, orthotics/prosthetics, and ophthalmology. I was briefly redeployed during the 2003 SARS outbreak as a frontline worker. To help raise money for Zika research, I also designed over 100 educational or humorous items on Zazzle for my Zika: Let's Stop a Global Pandemic Collection. Science News for Students posted a story about Jerouen Paul Lumabao, an incredibly bright 17-year-old from The Philippines, who found a way to kill mosquito eggs and larvae. Jerouen Paul Lumabao knew that many insect-killing chemicals were derived from plants. So he decided to test out three common plants where he lives. Tawa-tawa (Euphorbia hirta) is a hairy herb that grows in open grasslands, roadsides and pathways all throughout The Philippines. Lemon grass (Cymbopogan citratus) is a widely used herb in tropical countries, especially in Southeast Asia. It is added to foods, beverages, for treating digestive problems, achy joints, the common cold, and exhaustion. Lemon grass is also used to kill germs and as a mild astringent. A perennial called the San Francisco plant (Codiaeum variegatum also known as the variegated croton). It is kept as a household plant in cooler regions and is shown as my intro photo. First, Jerouen picked the leaves off of the plants and allowed them to dry for a week. Then, in separate containers, he soaked the dried leaves in alcohol and allowed the alcohol to evaporate. Once the alcohol evaporated, only a concentration of oily liquid remained. He had created three different plant extracts. Each extract was dipped into water which contained mosquito eggs and larvae. Jerouen discovered that tawa-tawa (Euphorbia hirta) and lemon grass (Cymbopogan citratus) extracts caused the larvae to develop "unusually". He surmised they would not have matured into healthy adults. But incredibly, the San Francisco plant (Codiaeum variegatum) was lethal. Within 24 hours, it had killed all of the mosquito eggs and larvae in the water. Since Aedes and Culex mosquitoes will enter buildings, live in underground tunnels, subways, basements, etc., it's easy to maintain this plant all year long. First, you only need to water it when the soil is dry (about once a week). Second, it prefers indirect light (you do not need to keep it in a window sill). Third, it's a perennial that blooms year-round. Bonus: It's colorful. 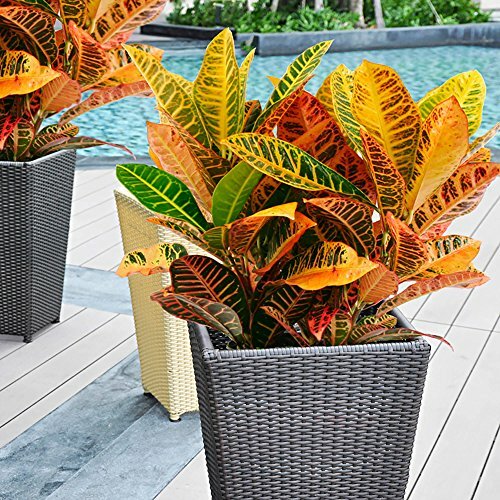 1) Perfectly healthy Codiaeum variegatum plants may naturally drop the occasional leaf. Just allow leaves to drop off the plant on their own (no need to cut or pluck). 2) As the plant grows, you may need a larger pot. If the roots are bound up tightly, loosen them so they can spread out and nourish the plant more effectively. 3) Don't overwater, it can cause leaves to drop, root rot, and even kill the plant. Moderate soil moisture is best. Just water the plant enough to keep the soil moist. Water once a week (if outdoors) and perhaps more often (if kept indoors). 4) An all-purpose, water-soluble fertilizer can be used about once a week (during growing season). Be sure to read the label carefully. 5) If the potting soil is getting old, replace about 1/3 of it. Potting soil should be dark brown to black. 6) Keep potted plants away from vents and air conditioning, if possible. A spot with partial shade (about two hours of direct sunlight) is all that is needed. 7) You can mist your Codiaeum variegatum, but there should be no runoff from its leaves. 100 percent satisfaction is guaranteed. This plant is shipped bare root. Bare root plants and trees have larger root mass, grow better, and are easier to handle and to ship. Instructions for how to plant are always available, let us know if you need it. Remember, there is a free gift available upon request. After looking up several helpful posts about how to make plant leaf extracts, I decided to write up the simplest method. Some people have employed artificial methods of drying plant leaves (e.g. oven, microwave, food dehydrator), however, I worried they might denature the chemical properties of the plant. Therefore, I felt allowing the leaves to dry out naturally would yield the best results. 1) Gently wash leaves to remove any pollutants and pat dry. 2) Place leaves (in a single layer) on a clean shallow pan or cookie sheet and allow them to dry out for at least a week. Crumble dried leaves in a ziploc bag and pour into a measuring cup. 3) Use a 50 percent hydroethanolic extraction of the plant leaves. Adding 50 g (1/2 cup) of the dried leaves to 500 mL of 50 percent ethanol. Note: Since ethanol is sold in 90 percent concentrations, stanbon(73846) offered the answer on Algaebra.com. Add 222.22 mL of pure water to your 500 mL container to prepare 500 mL of 50 percent ethanol. 4) Spread mixture out over shallow pan and allow methanol to evaporate. You should be left with an oily liquid. I would also suggest straining it through a cheesecloth after a couple of days if it appears too watery. 5) Add this oily liquid, Codiaeum variegatum extract, to standing bodies of water that are breeding grounds for mosquitoes in and around your property. Be mindful that dumping standing water (if possible) is ideal, though. My Zazzle collection now has 135 products that educate and promote the prevention of the spread of Zika. Every item purchased will help fund Zika research. You can even customize most of the products with your own logo, artwork, image and/or text. You can keep up-to-date on my devoted Facebook page called Zika: Let's Stop a Global Pandemic. This is a very welcome bit of news concerning the Zika virus. Thank-you! Yeah, every little bit helps. And I'm not surprised a teenager figured this out. Thanks for dropping by and commenting. Oh, It's a good article. We're going to kill zika. I hope.